I’m not the world’s greatest movie reviewer. “What?” I hear you cry. “That time you mumbled on about Halloween Resurrection for nearly 2000 words was great though!” That’s very kind of you, dear reader, but I’m not; and I’m certainly not good enough to write about “April Fool’s Day” without spoiling something important. So here’s the deal – it’s a great movie, go and watch it. 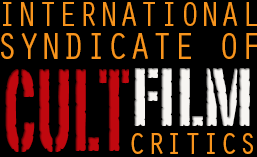 Seriously, you won’t be disappointed, with a few very limited exceptions it’s perhaps the best movie to have ever been lumped in with the slasher genre. Then come back here after you’ve done it and we can have a nice chat – of course, if you’ve already seen it, read on. So, did you figure it out? The first time I watched it as a teenager, I was completely fooled right up to the reveal, but when you watch it for a second time they give you an absolute ton of clues that are just cleverly disguised as exposition. If you’ve been a very bad person and continued reading past this point, or don’t remember the details, the basic gist of things is Muffy St John (Deborah Foreman, who by rights should have had a fantastic career but stopped acting on screen in the mid 90s) has invited eight of her friends to spend spring break at her family’s huge mansion on an island somewhere near Martha’s Vineyard (“on a clear day, you can see the Kennedys”). Crucially, the eight don’t all know each other, and are from different parts of Muffy’s college life – study partners, drama club friends, ex-boyfriends – and the early part of the movie gets us to know these characters, while at the same time telling us everything we need to know about this magnificent movie. Anyway, the college kids play pranks on each other – fake knives, blood squibs, and all that – so you’re sure that the killer, when they’re revealed, will be deadly serious. It’s not like “My Bloody Valentine” is actually a romance film about faking a bunch of murders to get a date, right? (Although seriously, that would be an amazing idea for a movie – and if you want to see “trick the audience” done in the wrongest way possible, check out the 2009 “My Bloody Valentine” remake). The weekend starts with an accident, so there are no boats on the island…then the pranks continue, but become less funny when people start disappearing. Who’s behind it all? Why has Muffy suddenly changed her clothing, hairstyle and personality? Will the Sheriff ever make it over to them? It’s the way it looks so much like it’s going to be your typical 80s slasher movie that makes it so rewarding, I think. Firstly, a note about the actors. It’s a rarity for an 80s horror movie to not have you grimacing about at least a few of the main characters, so it’s a real treat to have a small cast, all made up of people who nail their parts exactly. Most famous to us is Thomas F Wilson as Arch (you’ll recognise him from the “Back To The Future” movies); but there’s Amy Steel from “Friday the 13th Part 2”, and plenty of people who’ve had long careers in film and TV; even if a similar amount gave up on acting in the early 90s. Perhaps we ought to give credit to director Fred Walton (“When A Stranger Calls”) and writer Danilo Bach (the first “Beverly Hills Cop”) for the skilful mix of horror, suspense and comedy, and the cast of believable types. Another thing, while I’m gushing with praise, is the way the movie looks. Slasher movies, and by extension 80s horror, barely ever bother with any of the art of cinema – they’ll just go “what’s the cheapest and easiest way we can get from murder A to murder B?” April Fool’s Day, on the other hand, features tons of little moments that make you realise someone was really making every effort on this – a character walks through a small pool of light on his way across a pitch-black deck, looking out over the lake, something as simple as a shot of a corridor…it’s perhaps easiest to say you only notice the “craft” of cinema by its absence, but after watching months of terrible slasher movies and summer raunch, you can really tell when someone knows what they’re doing. It appears cinematographer Charles Minsky used this as a calling card and went on to a long career (including filming “Pretty Woman”, among many others). Because nothing’s perfect, if you really think about it, and watch it a few times, there’s the odd problem that brings you slightly out of the movie. For instance, the Sheriff is called when the phone briefly works, and he’s at the hospital with the deckhand who was injured at the beginning of the movie. Except why would he be? And why would he look so serious? It’s there to trick us, obviously, but it probably ought to have been replaced with the fuzzy sound of him on the phone. And the post-movie coda doesn’t make a lick of sense. Anyway, small potatoes. 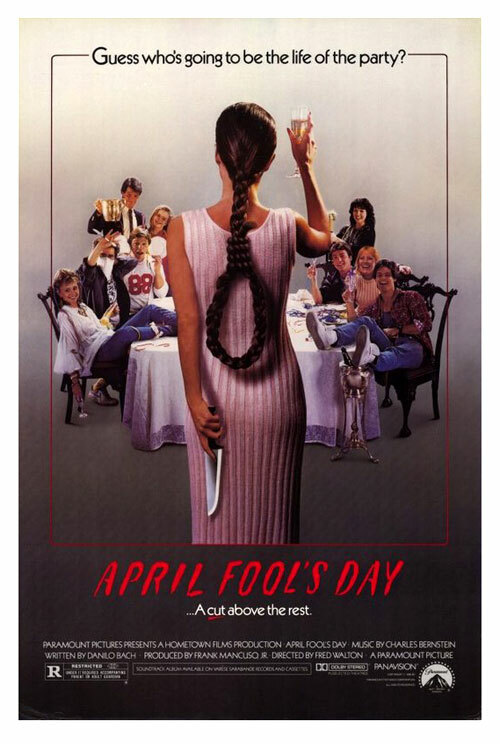 “April Fool’s Day” is mentioned briefly in the 2006 documentary “Going To Pieces: The Rise And Fall Of The Slasher Movie”, and divides opinion. One former exec says he loved it, but others are less friendly, saying marketing what is effectively one long joke as a horror movie was a bad idea. What was a bad idea was making tons of terrible horror sequels and garbage slasher movies, but whatever. Good films, to movie execs = films that made money, nothing else. While the DVD is pretty bare-bones, it’s also $0.01 on Amazon (packaged with the original, half decent “My Bloody Valentine”) so it’s absolutely worth checking out. 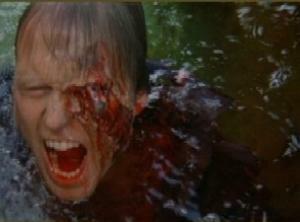 A classic of 80s horror, every bit as much fun the second time of watching as it is the first.